Looking for fun things to do in Phoenix AZ? Look no further! 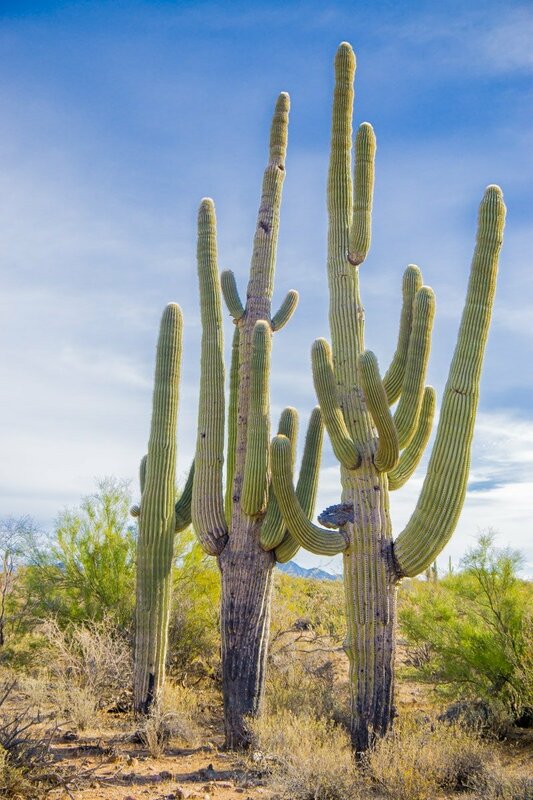 This list has enough things to do in Phoenix to fill an entire vacation if not more! 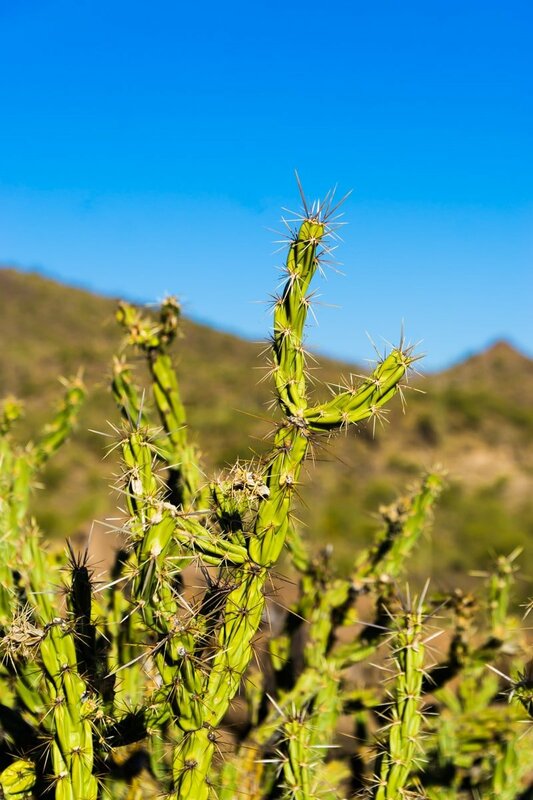 Whether you’re looking for things to do in Phoenix with kids or just with friends, there’s a little bit of something for everyone! Thank you to Visit Phoenix for hosting us for this girls weekend in Phoenix! While we received complimentary lodging, food, and activities for this post, all opinions are 100% honest and my own. This post also contains affiliate links that may earn me a small commission at no additional cost to you. 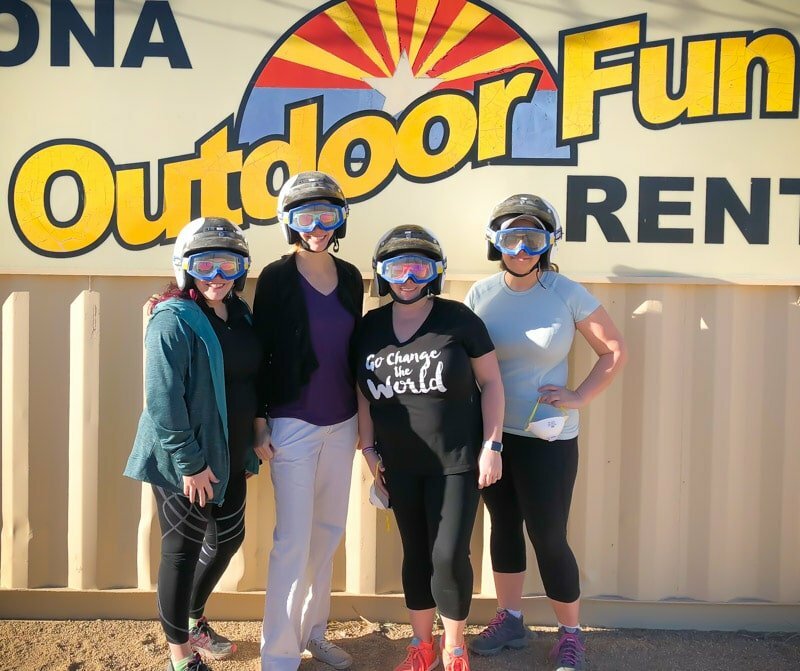 A few months ago when the daily temperatures weren’t above 100 degrees, I had the chance to head to Phoenix Arizona to try out some outdoor adventures with a couple of my girlfriends! We had plenty of fun outdoors, ate amazing food, and stayed up way too late like you do on any good girls trip! I put together some of the highlights from that trip as well as from my own family’s trip to Phoenix for my sister’s bohemian wedding a few years back! Whoever recommend to her that getting married in Phoenix during the summer was a good idea was out of their mind, but Phoenix still holds a special place in my heart for her sake. I like to find the most unique things to do different places – things you can really only do in those places (or maybe a few other places but mostly unique to that area). Everything we did was pretty much unique to the Phoenix area and honestly unique in general. And since we ate so much – I of course included lots of places to eat as well! I was going to write a standalone where to eat in Phoenix post but really most of the places we ate were unique experiences, not just restaurants. 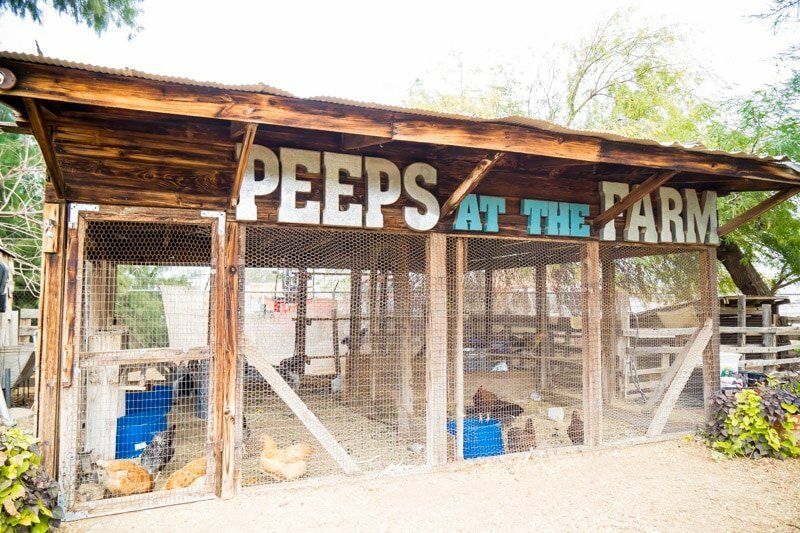 And experiences deserve to be on this list of fun things to do in the Phoenix area. Oh and that brings me to one more point – Phoenix is a metropolitan area that encompasses a whole bunch of suburbs all considered the Phoenix area – Flagstaff, Tempe, Mesa, etc. I’m calling this post things to do in Phoenix but really these places are all just in the Phoenix area. 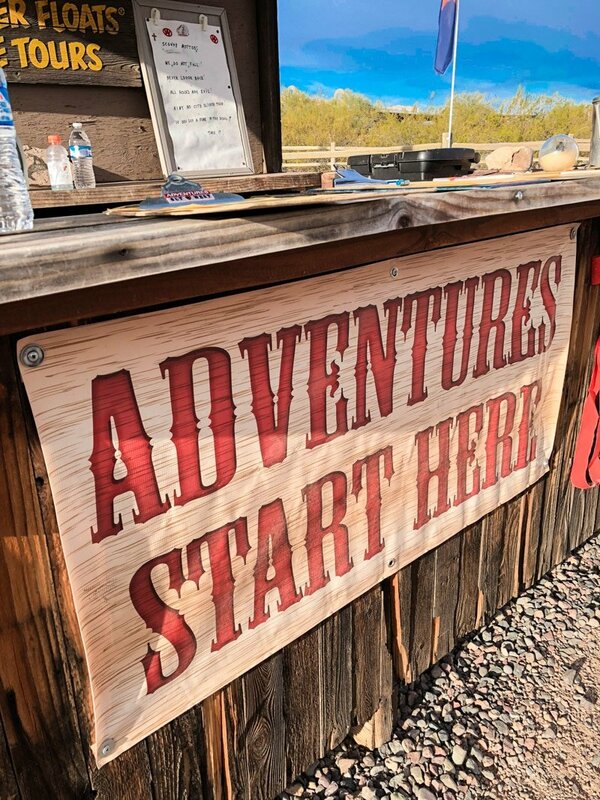 I’ve included a map at the bottom of this post with the locations of all of my recommended things to do in Phoenix so you can see where they are for planning your trip! 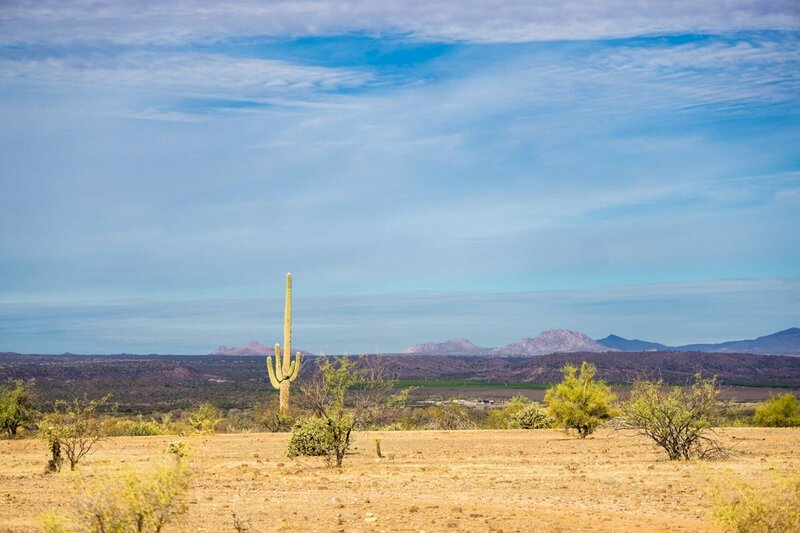 If there’s one thing people know about Phoenix, it’s that it’s the desert. So take advantage of that and explore the desert in as many ways as you can. 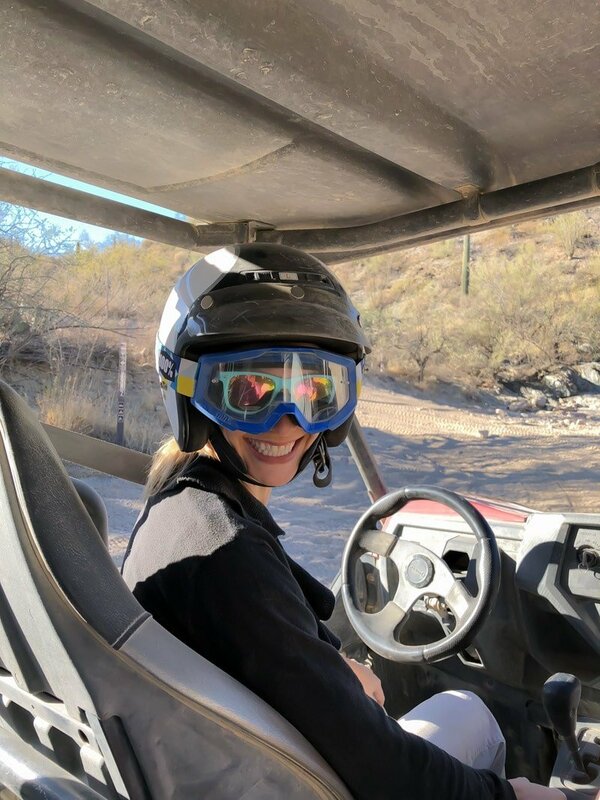 Our first day exploring Phoenix we had the chance to do an awesome UTV tour with Arizona Outdoor Fun Adventures, and it’s easily at the top of my list of fun things to do in Phoenix. The four of us girls packed into a quad ATV and followed our guide up and down small desert roads giving us our first glimpse of the gorgeous desert scenery. It was adrenaline pumping, a bit scary, and an overall seriously incredible adventure that I’d do again in a heartbeat. 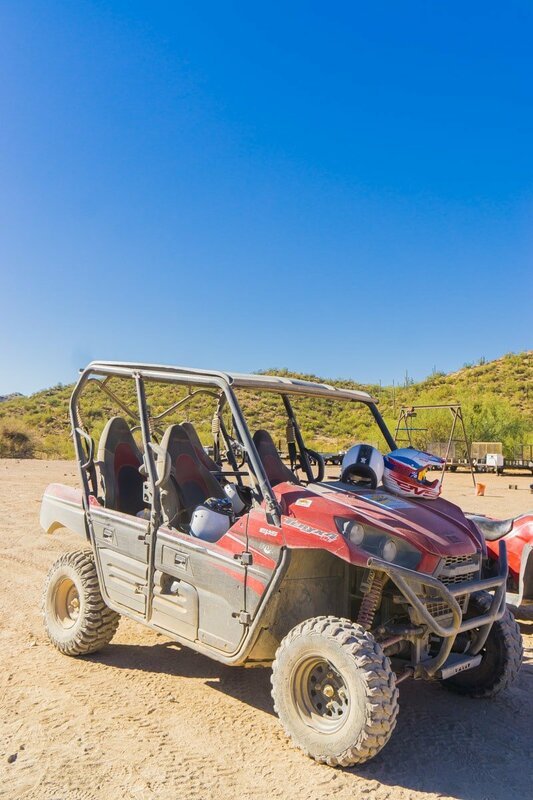 Arizona Outdoor Fun also offers ATV tours for smaller groups or groups that are a little more comfortable off-roading and in the desert. They also offer other combinations such as ride + shoot, shooting adventures, backcountry tours, and more. 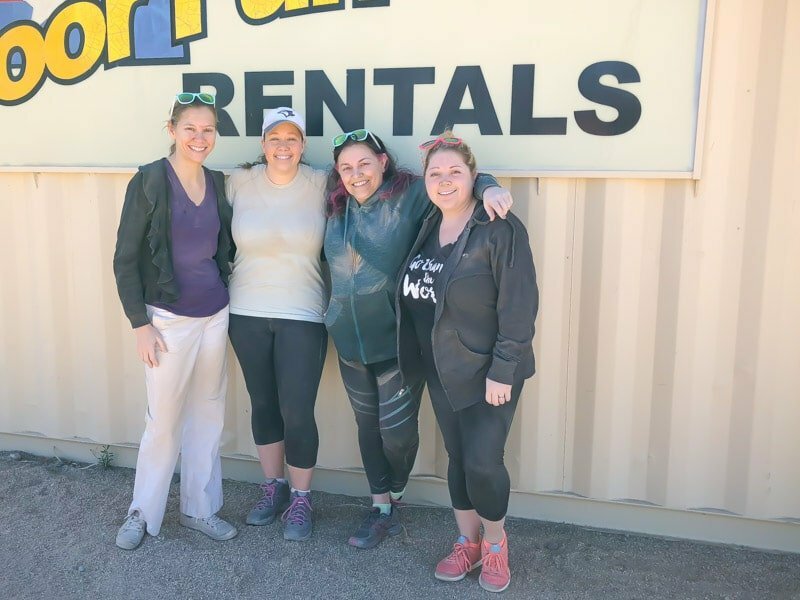 Both our tour guide and the team we worked with to get ready for for our adventure were fantastic, and I highly recommend this for anyone looking for outdoor adventure in Phoenix. One word of caution – wear clothes you don’t mind getting dirty. 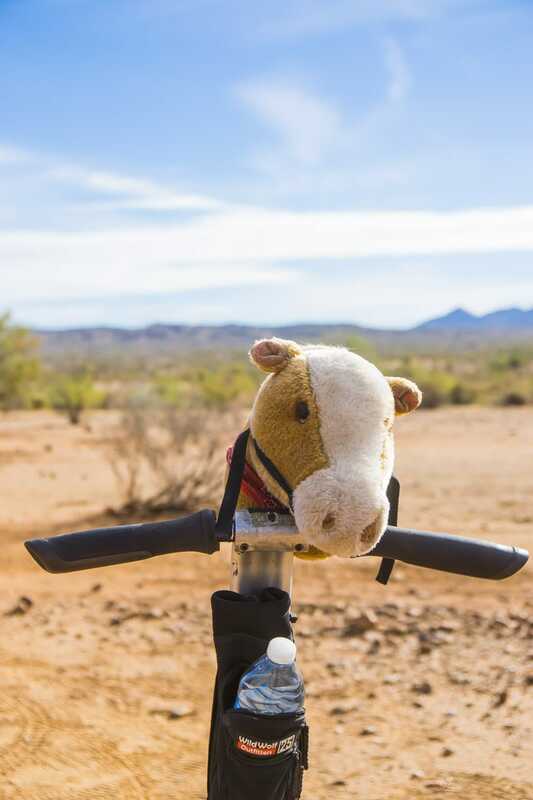 The desert is dry and dirty, so you’ll likely end up filthy by the end of the trip. Not looking for quite as much adventure but still want to explore the desert? 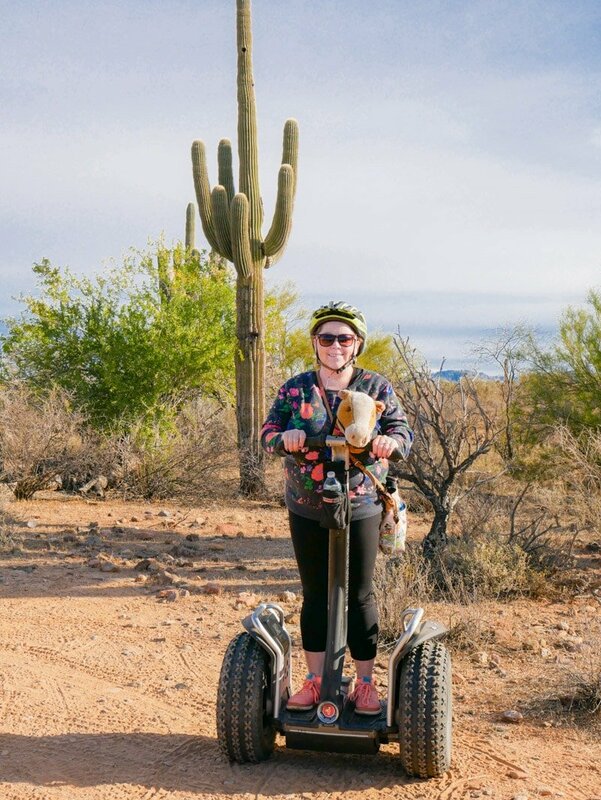 On our last day we did a desert segway tour with Fort McDowell Adventures and while it wasn’t quite as thrilling, it was almost a better way to get to explore and learn about the desert better. We saddled up our segways and did a 2-hour tour around cacti, through ditches, and even around the bones of animals who died from the heat. 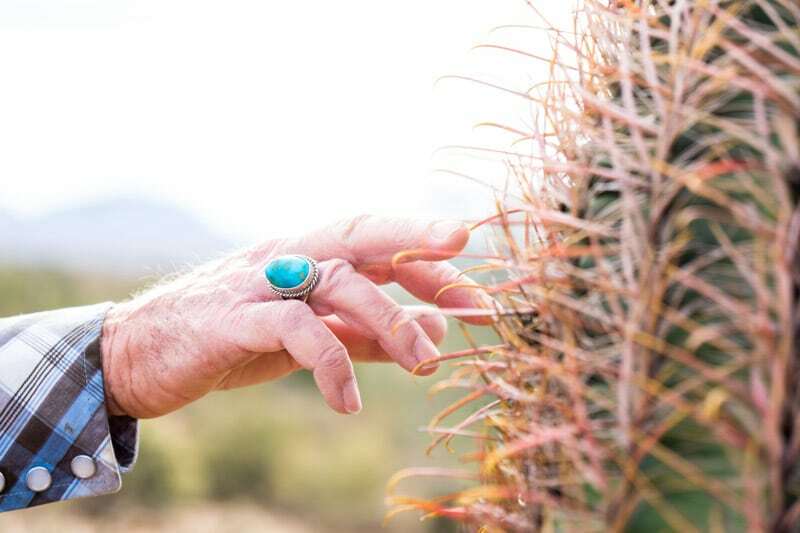 And our hilarious Fort McDowell Adventures guide even gave us the chance to try a bite of cactus if we were brave enough. It felt a bit more like we were actually in the desert rather than just driving on top of it like with the UTV tour. Less adventure but more personal and also highly recommended! 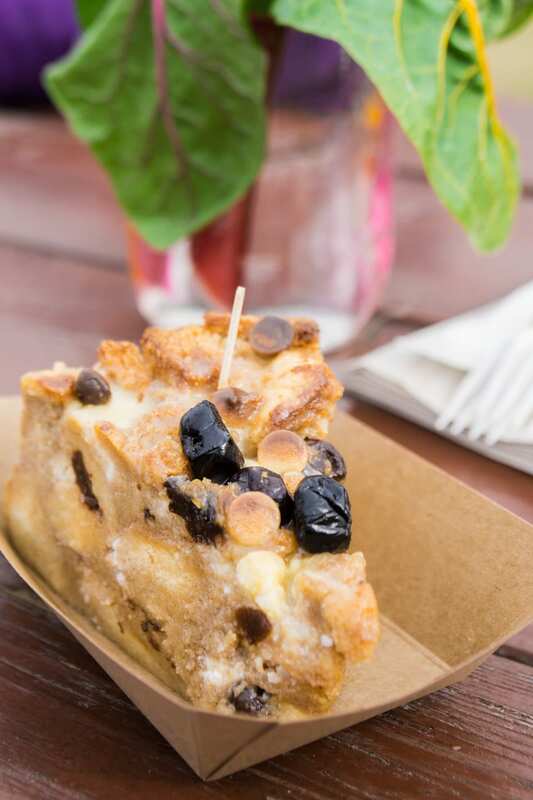 All those desert adventures are bound to make you hungry! 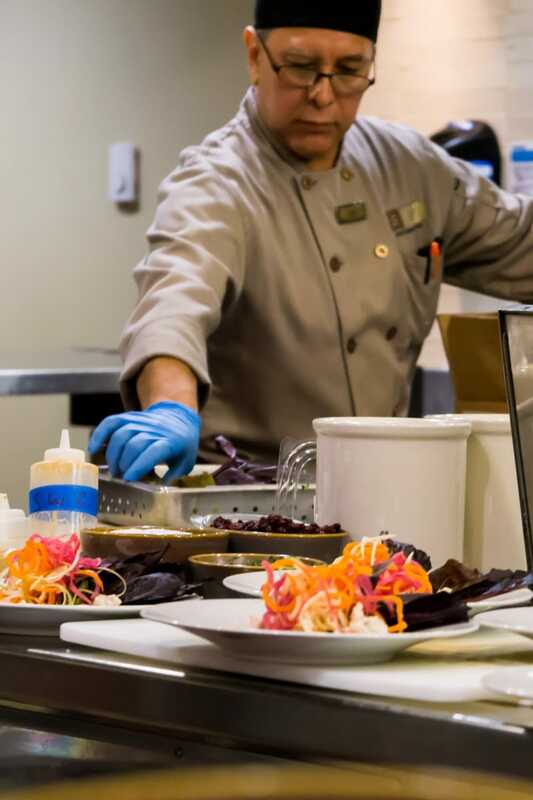 If you’re a fan of farm to table fresh food, the Fresh Foodie Trail in Mesa is a must-do. 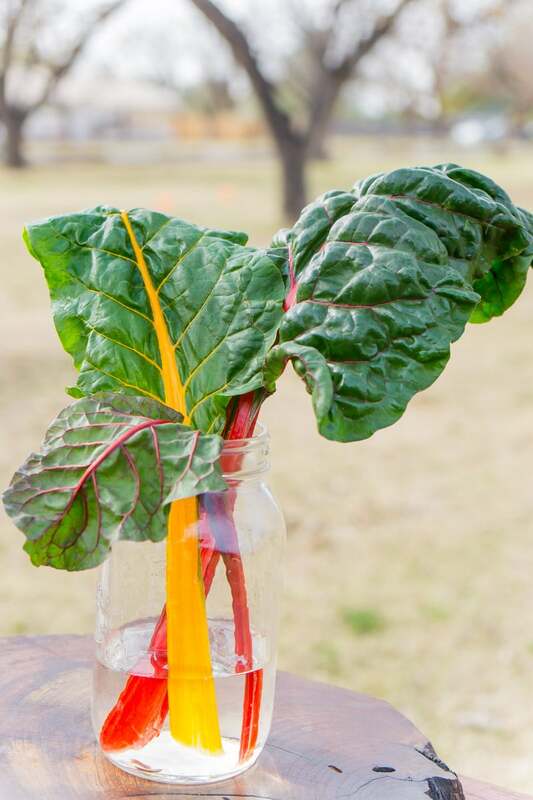 With a dozen different stops along the trail designed specifically for a road trip of culinary delights and experiences, adults and kids alike will love this quest to find the freshest food in the greater Phoenix Area. 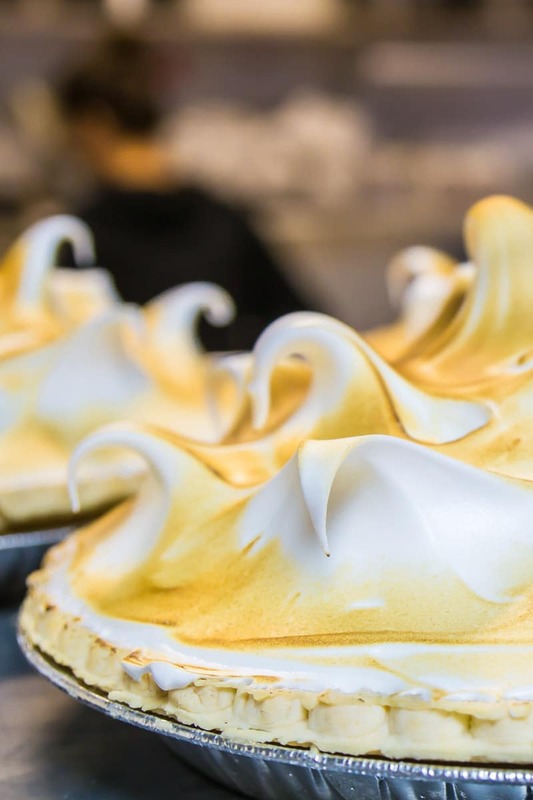 While we didn’t have the chance to visit all twelve stops on our trip, these are a couple of the highlights that can give you a good idea of what the Fresh Foodie Trail entails. 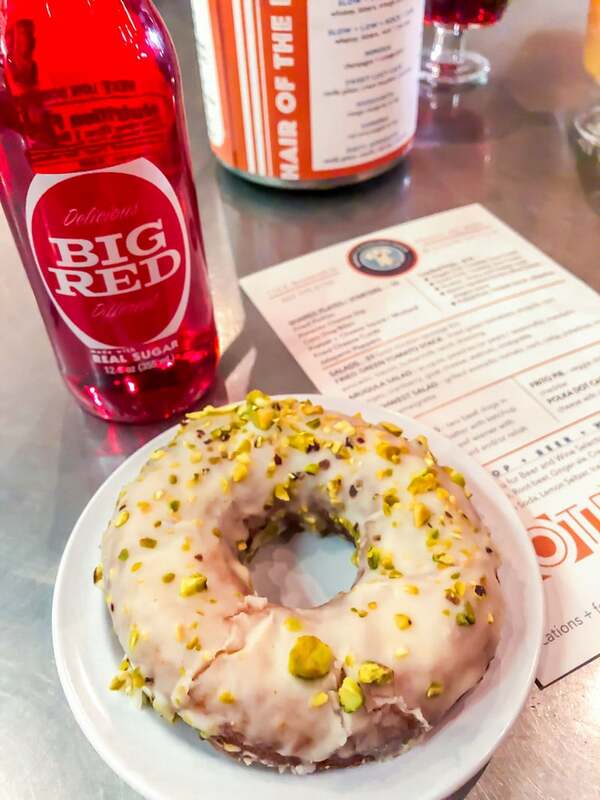 You can check the full list of Fresh Foodie Trail stops here. On their website Agritopia calls itself the place where people come together. And that’s exactly what it is. 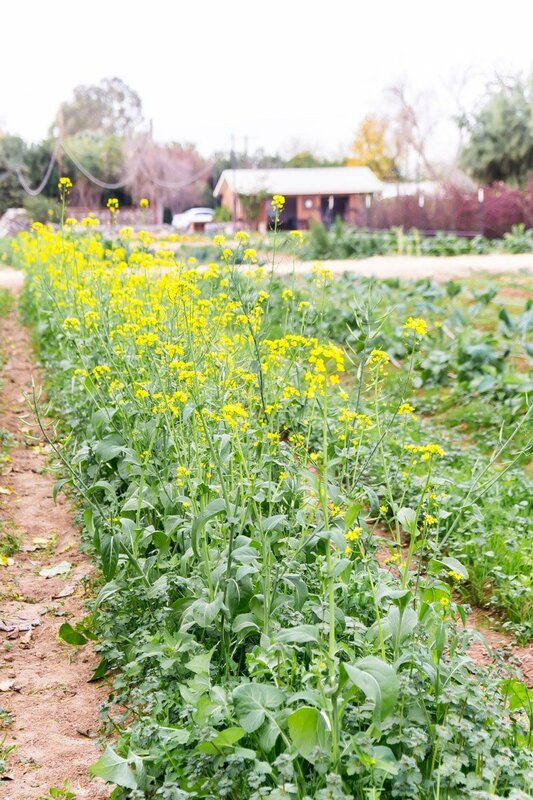 Agritopia was the first of our stops on the Fresh Foodie Trail, and I was amazed by what we found in this planned community that’s centered around an urban farm. 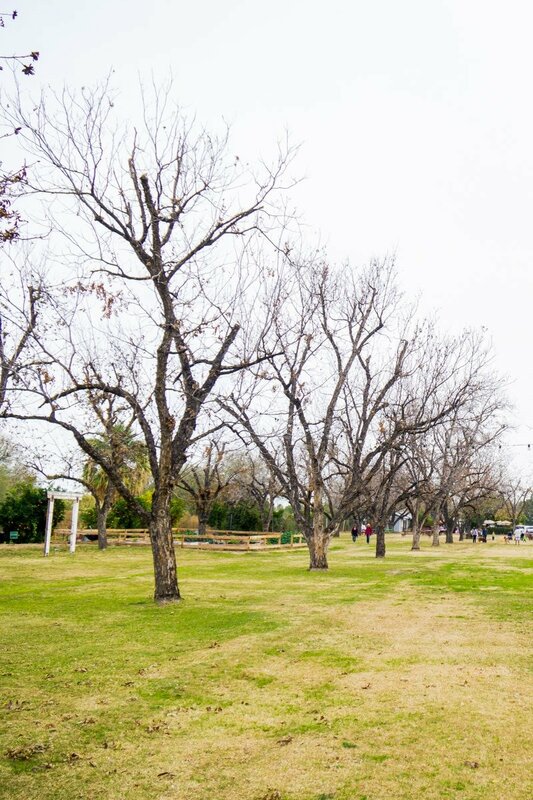 Sidewalks are lined with perfect trees, people live among neighbors that are also friends, and they work together to support one another in creative, agricultural, and culinary adventures. It’s really hard to describe until you visit, but it definitely had the sense of community, that and maybe a little Truman Project, but in a good way. 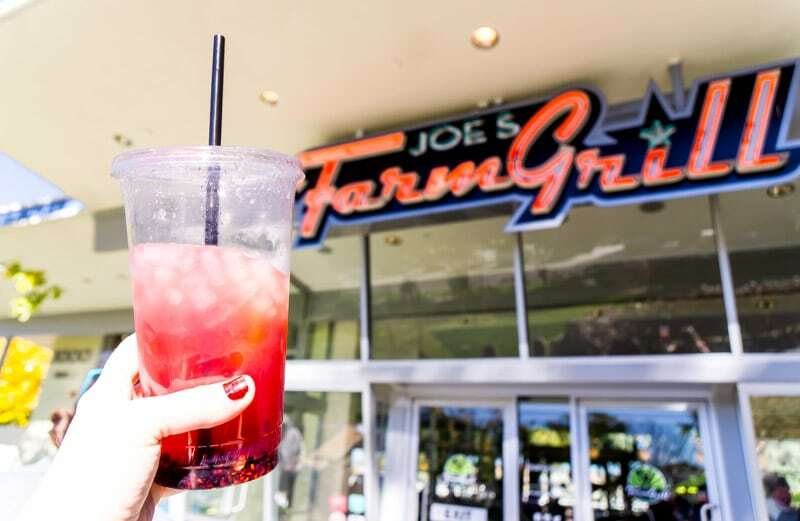 One of the shining stars of Agritopia is Joe’s Farm Grill, built where the Johnston family original lived, a diner that serves delicious comfort food elevated. 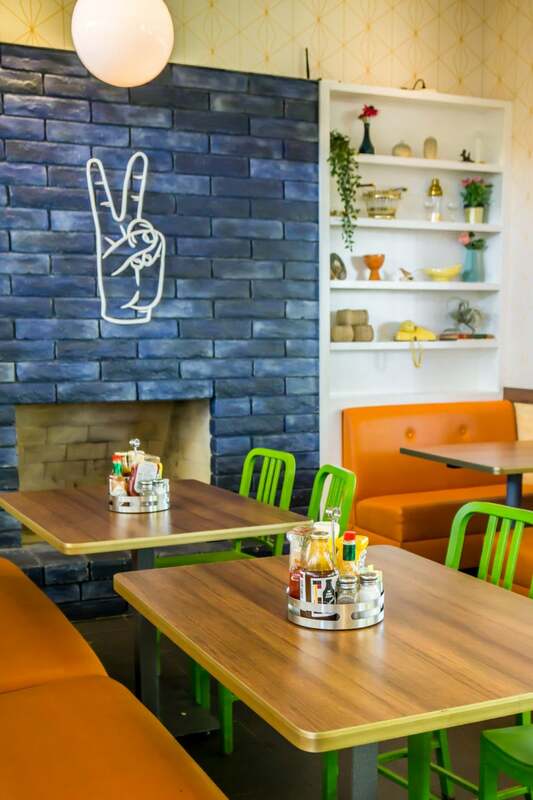 It has a cozy yet modern vibe with milkshakes, waffles, and street tacos. Everything we tried was delicious including the specialty lemonade! Everything is made using all natural beef, as many locally sourced products as possible, and quality ingredients so you can feel good about what you’re eating, even if it’s a milkshake. And the milkshakes at Joe’s Farm Grill are definitely worth getting! 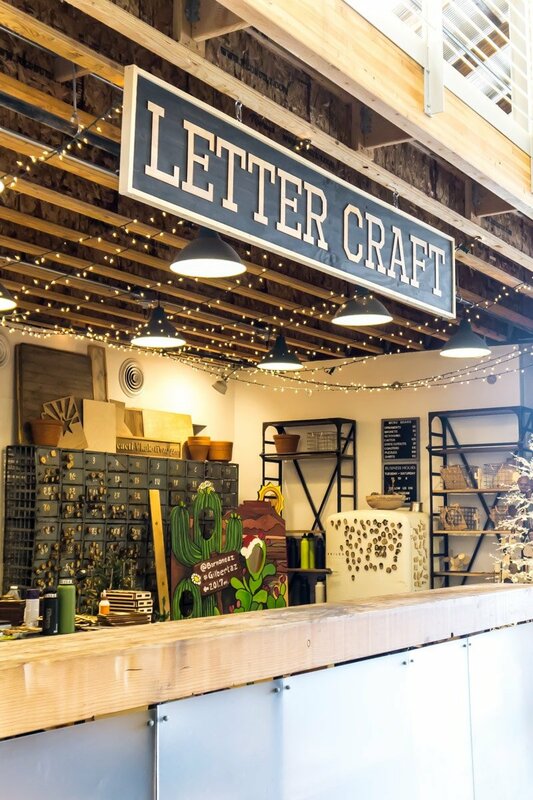 Don’t take off after your delicious meal at Joe’s Farm Grill – wander a few steps away from the restaurant to find Barnone, a creative and culinary delight filled with handmade works for twelve talented Arizona makers. We only had a few minutes to explore Barnone, but I could come back and just explore the handmade creations all afternoon. 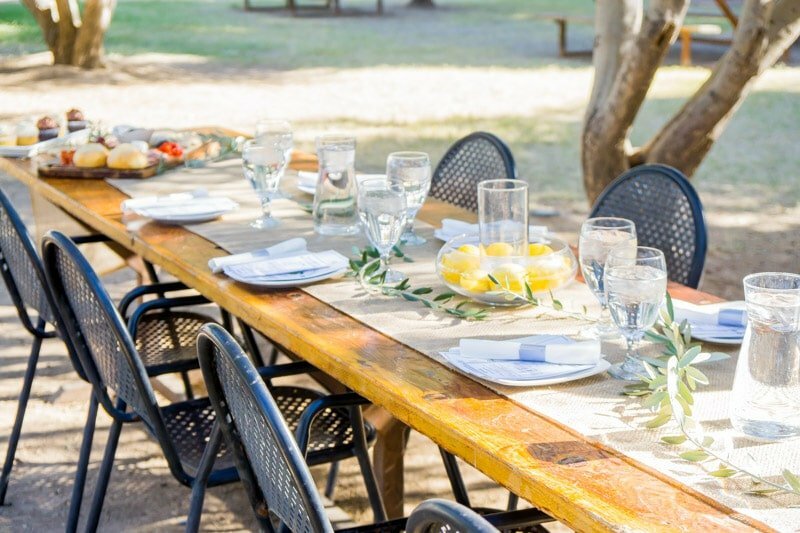 Our second stop on Mesa’s Fresh Foodie Trail was the Queen Creek Olive Mill for both an olive oil tasting and a delicious lunch in one of the most beautiful venues for outdoor events in the Phoenix area. Since I’m all about honesty here and only recommending things I think you’ll actually enjoy, I have to say the olive oil tasting was a bit dry. It was a lot of olive oil, not a lot of interesting information, and a bit too long for our liking. If you’re visiting with kids, definitely skip the olive oil tasting and just enjoy the food! If you’re with adults, play it by ear. If you have extra time go for it but if not, just spend some time walking through the shop, exploring the mill, and enjoying delicious food. 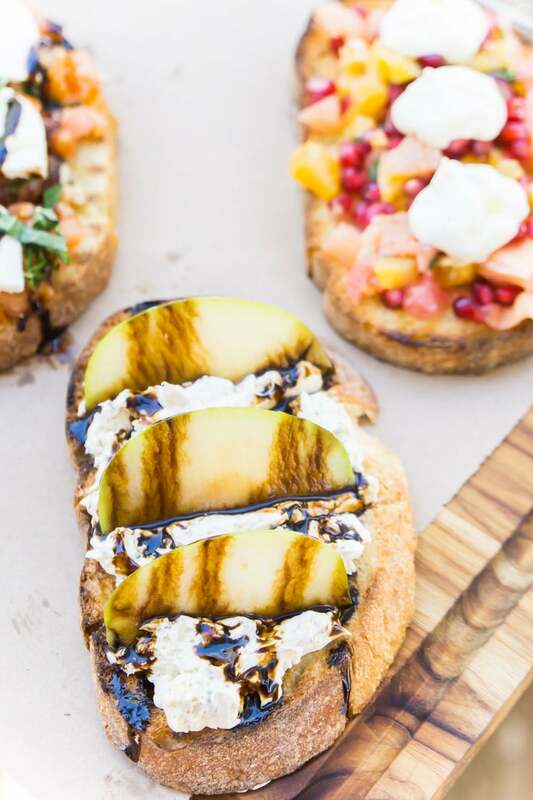 Out of all of the food we tried on our trip, I think the fruit crostini and the orange cupcake from the Queen Creek Olive Mill were two of my absolute favorites. 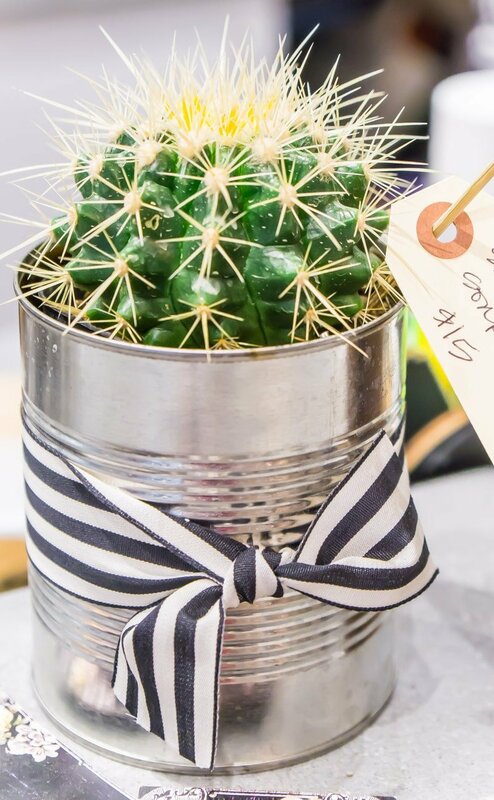 The mill regularly hosts special events, parties, and even things like baby showers. It would’ve been the perfect venue for my sister’s bohemian bridal shower if I’d only known about it sooner! 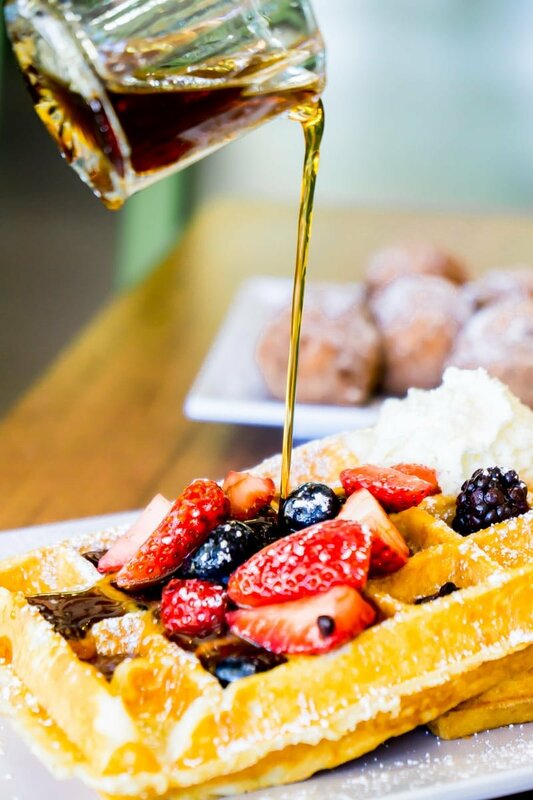 Since we’re on the topic of food, here are three more of the best places to eat in Phoenix while you’re visiting. I’m not saying these are the absolute best restaurants in Phoenix (I haven’t tried enough to commit to that title), but all three are fun and have a unique story and local flavor! 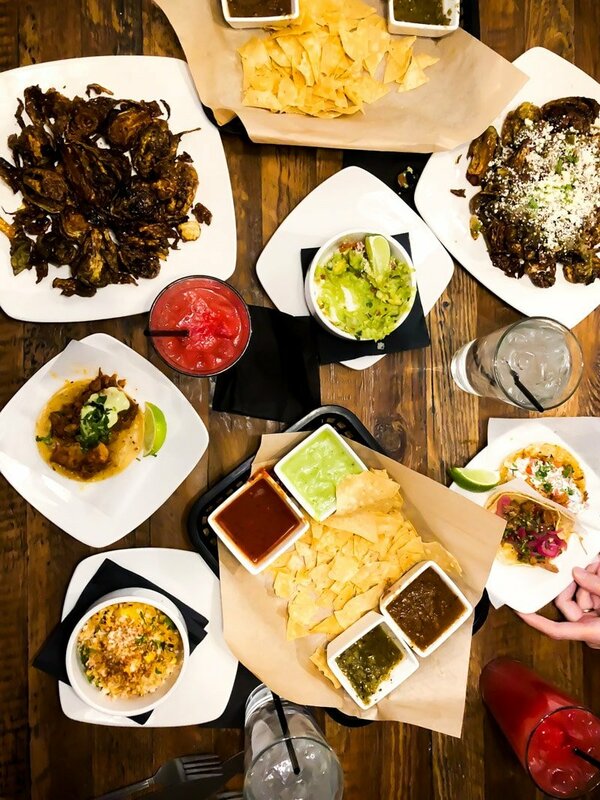 Our first dinner in Phoenix was spent at Revolu Modern Taqueria & Bar, a restaurant run by a married couple who really just loves good fresh food. 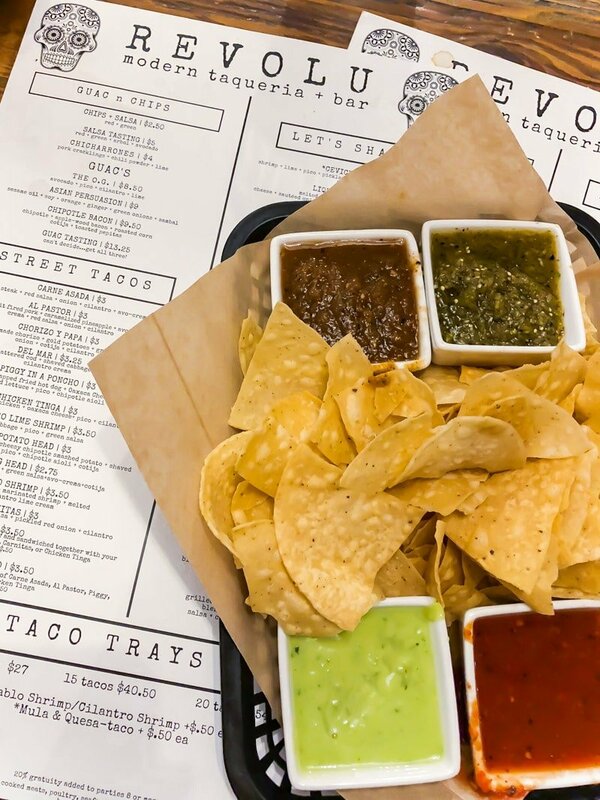 With hand crafted Mexican Street food, delicious drinks, and a colorful vibe – it’s a great place to grab a bite to eat on a weeknight or a weekend to let off some steam. Some of our personal favorites from the menu were the chips + salsa tasting tray, elote, las donas (donut holes), and of course the tacos. Try the al pastor tacos for a little sweet and a little spicy. Oh and another Revolu speciality is the churro ice cream sandwich. Get it and let me know what you think! 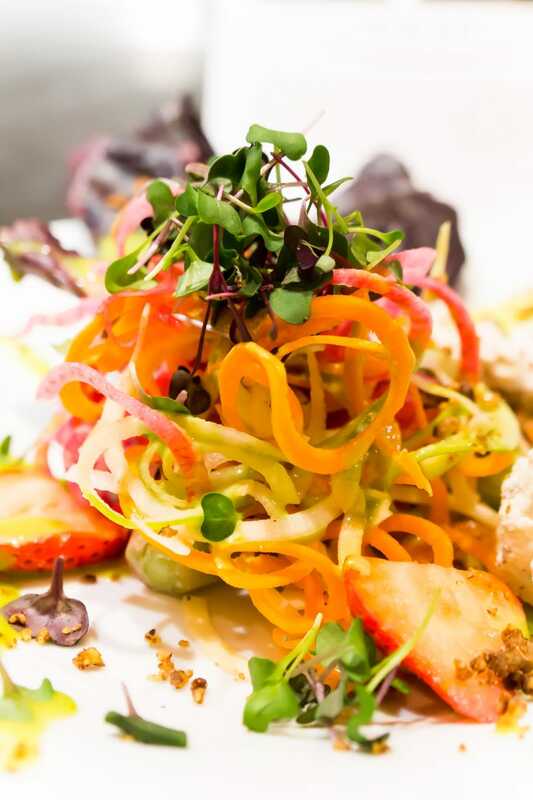 There’s one reason The Henry makes this list of most fun places to eat in Phoenix – the vibe. The food was okay but the atmosphere was amazing. 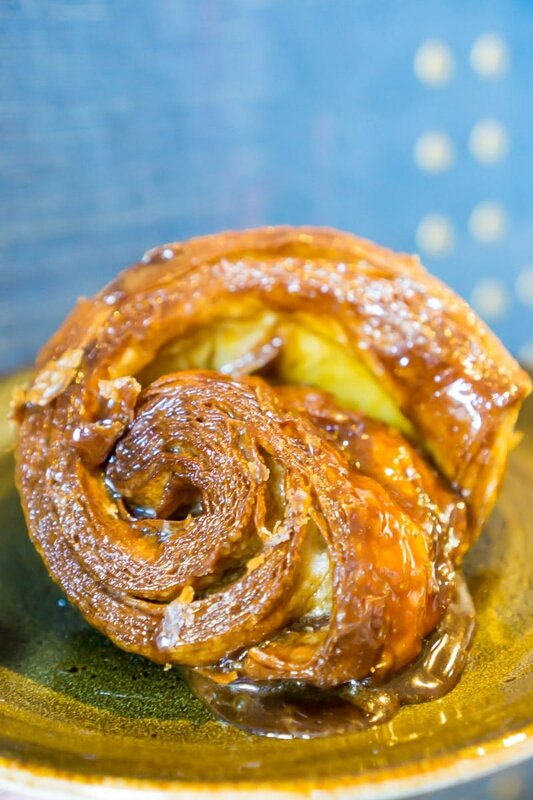 It’s a place people go to gather, to enjoy a pastry and brunch on a Saturday, and a place you just enjoy. 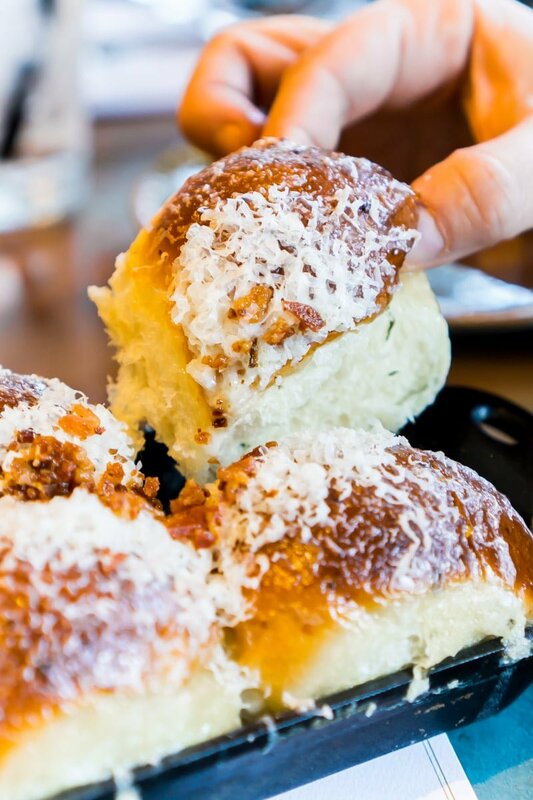 Some of the food highlights we tried were the warm parker house rolls, white truffle parmesan fries, and the massive cinnamon roll. 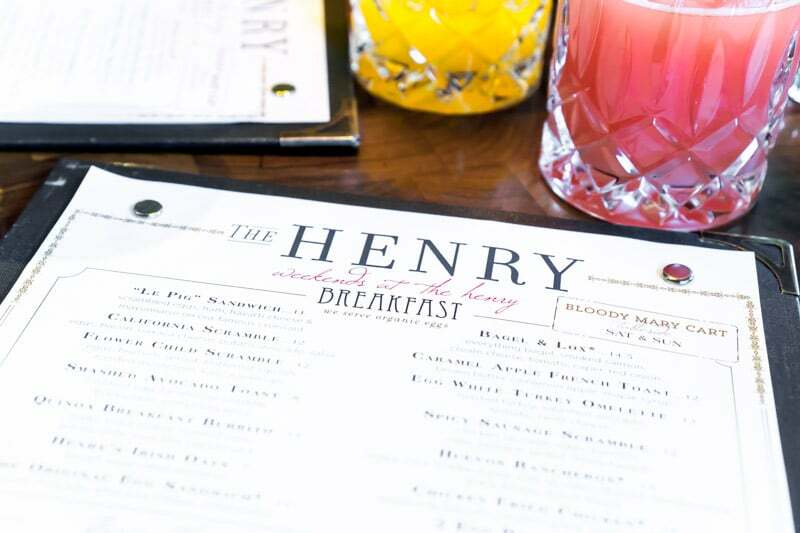 And I just found out that there’s a The Henry location near me in Dallas so woohoo! 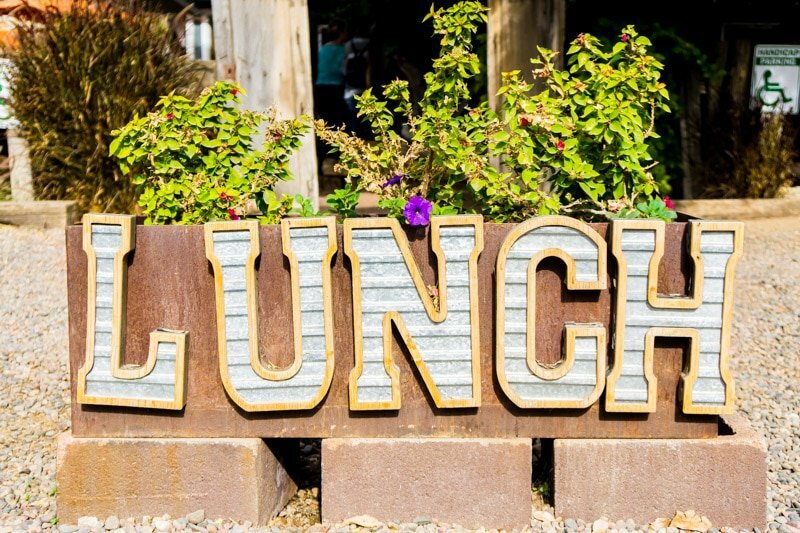 Rock Springs Cafe may or may not make it on your list of places to eat in Phoenix depending on what else you do. 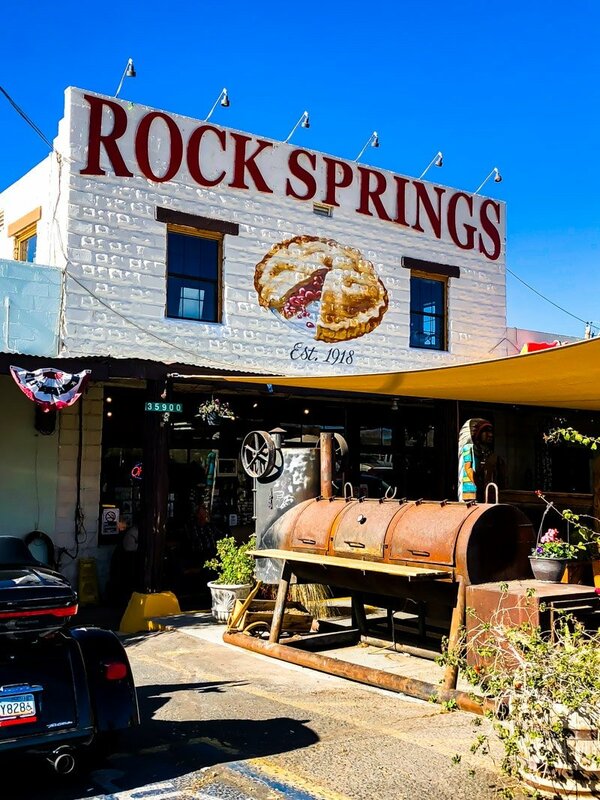 If you’re planning to do the ATV tour I mention in this list, then Rock Springs Cafe is a no-brainer since it’s literally next door to where you meet to hop in your quad or ATV for the tour. If you’re not doing the tour, you can probably skip it. 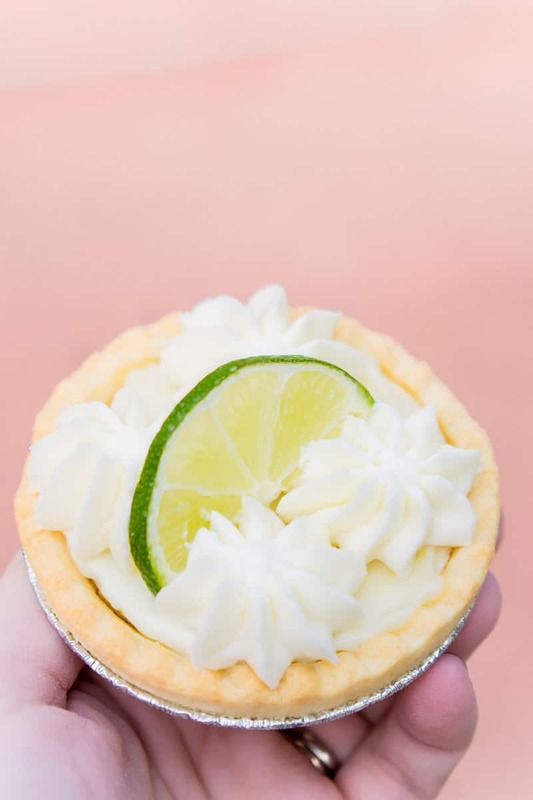 Unless you like pie – if you like pie, it’s almost worth booking the ATV Tour with Arizona Outdoor Fun just to have an excuse to come check out all of the Rock Springs Cafe pies. Funny story – I was born in Laramie, Wyoming but my parents both met in Rock Springs, Wyoming. So when I saw Rock Springs and saw that their speciality was pie, I knew where we were eating for lunch. The food is diner food that’s just okay but the pies are worth trying. Just beware that you might want to come with a big group so you can order a whole bunch of different pies to try without looking crazy. 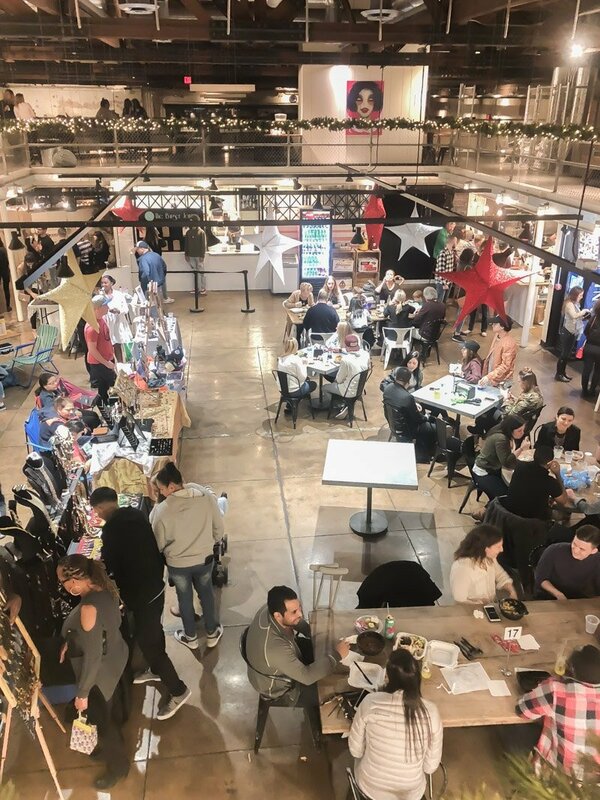 On the first Friday of every month, First Fridays Phoenix happens downtown to celebrate art, culture, and more. One word of caution – the description of this event sounds lot more family-friendly than it is. I personally wouldn’t bring kids because of some of the content of the artwork and booths open, but I’m also extremely conservative when it comes to my son. 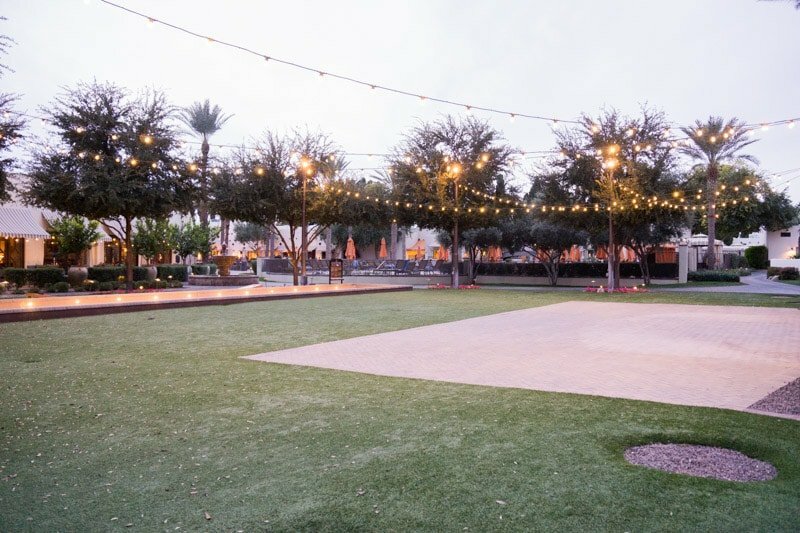 Park at the Phoenix Art Museum for First Fridays Phoenix and take the free trolley downtown to explore booths, check out some more cultural venues, and wander around downtown for a bit. 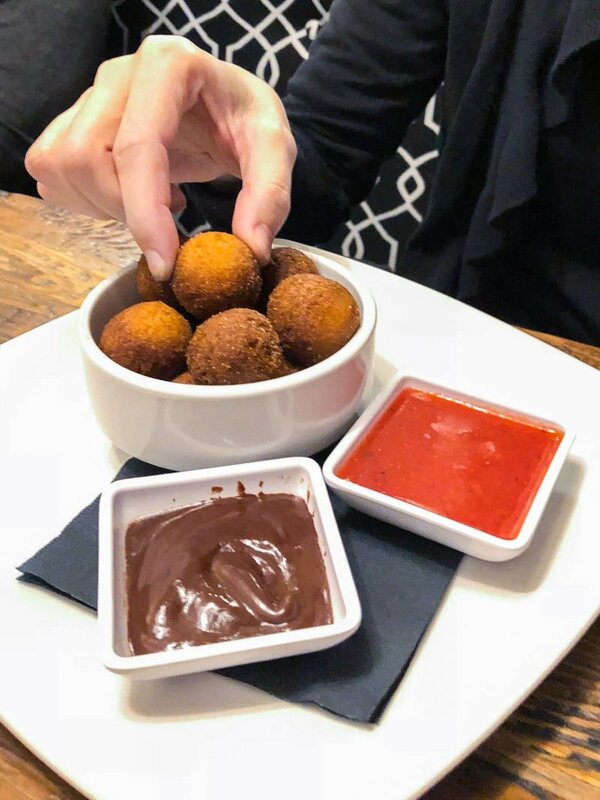 Then skip out on First Fridays and hit either one of the local eateries in Desoto Central Market or a standalone restaurant like Short Leash Hot Dogs (hot dogs & doughnuts). 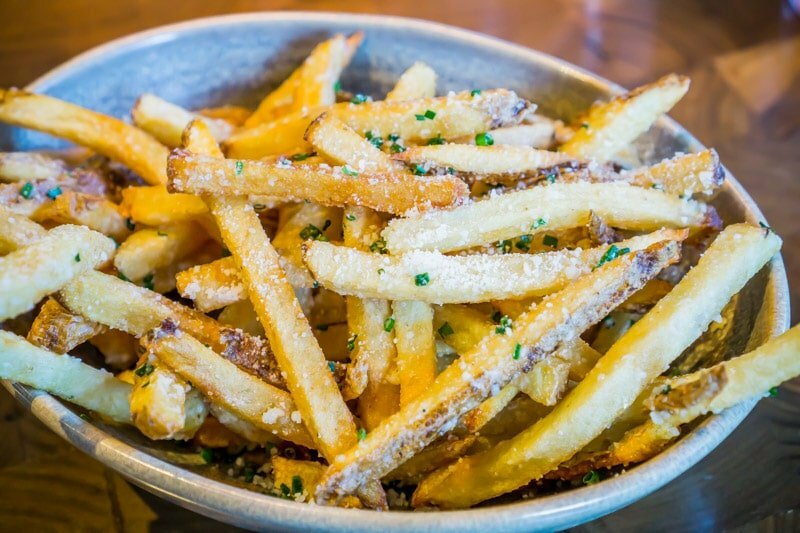 Or skip dinner altogether and go straight for apps and drinks at Bitter & Twisted. 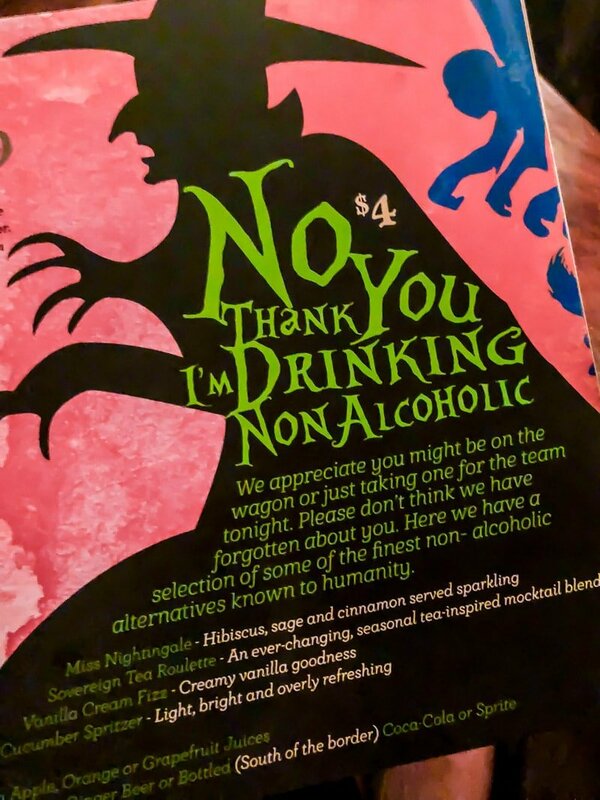 I’ve never seen a more creative non-alcoholic drink menu, and that was just the non-alcoholic drinks. And the grilled cheese bites were good enough that I ordered seconds off the Bitter & Twisted late night menu. If you could ask me what my dream life is, it’s owning a place like The Farm at South Mountain in another life. 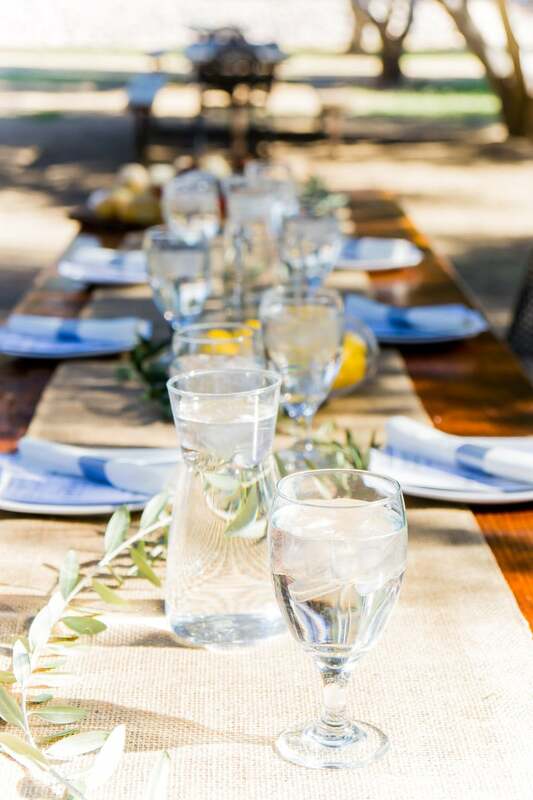 The Farm at South Mountain is part farm to table restaurants, part farm, part picnic area, and part place where you can just relax and take a break from the stress of life. With three restaurants to choose from, co-op crops and gardens, and a gorgeous area that’s used for both events and just hanging out – there’s really no other way to describe it than my dream weekend destination. If it was in the DFW area, I’d be there all the time. 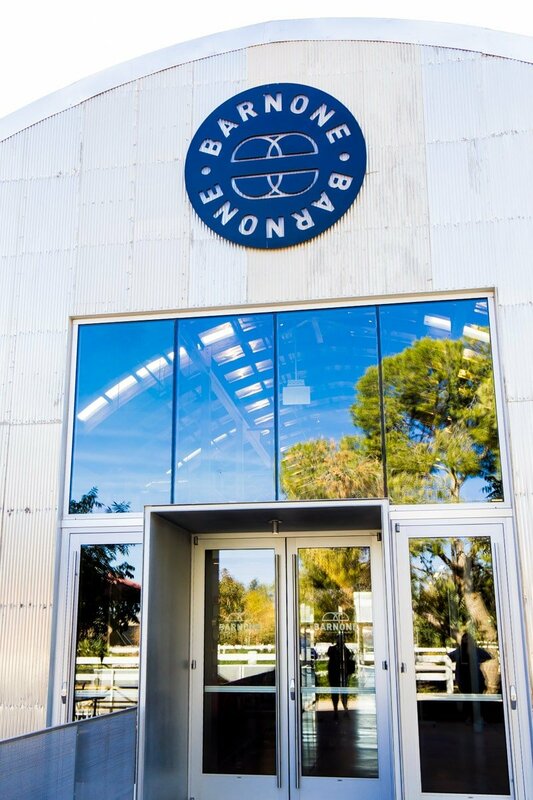 We had the chance to grab lunch from the Farm Kitchen and not only was my raspberry goat cheese salad with pricky pear vinaigrette salad delicious, it was beautiful too. And don’t even get me started on the pastries and desserts. If we’d been there longer, I probably would’ve needed to try them all. 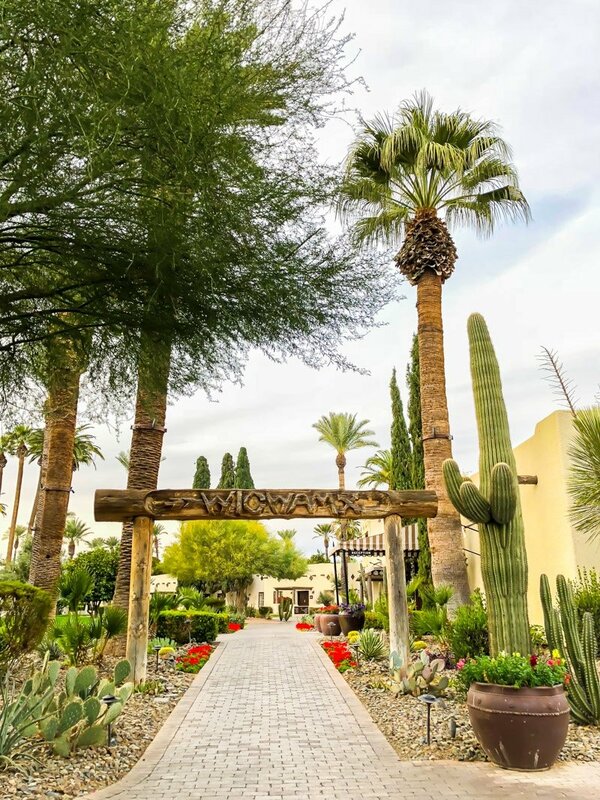 Every vacation needs a little relaxation and a little pampering and there’s no better place to do that than Spa Avania at the Hyatt Regency Scottsdale Resort & Spa. With unique offerings like salt room experiences and spa treatments from all over the world, this spa has it all. And the Hyatt Regency has a kids club so if you’re visiting with your kids, send them to have fun at the kids club while you enjoy a relaxing afternoon or evening at the spa. All four of us women had the chance to do both a salt room and a massage and all four of us said the massages were terrific. The other highlight of Spa Avania is the private hot tub area, private pool, and huge relaxation area (with warm weighted blankets) that really makes you feel as pampered as you deserve. 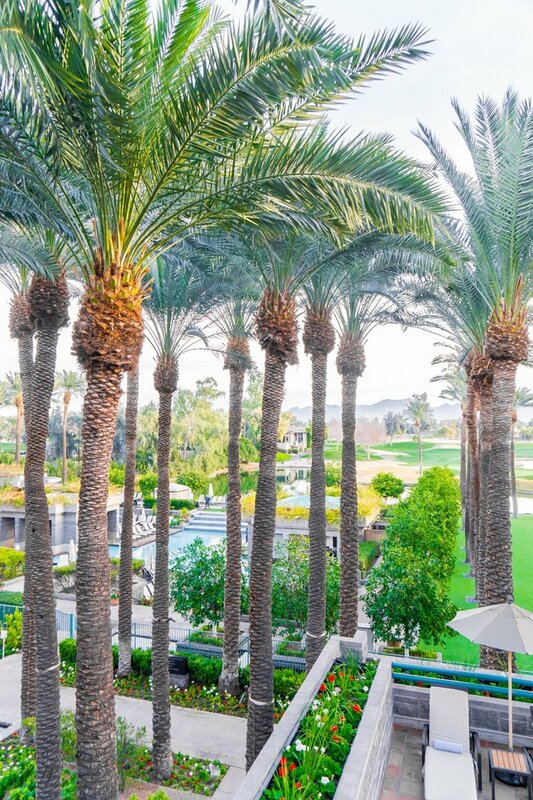 My friend Jana wrote up a full review of the Hyatt Regency along with why it makes the perfect location for a girls getaway to Phoenix! The other thing most people know about Phoenix is that it’s hot, or at least it’s hot most months out of the year. 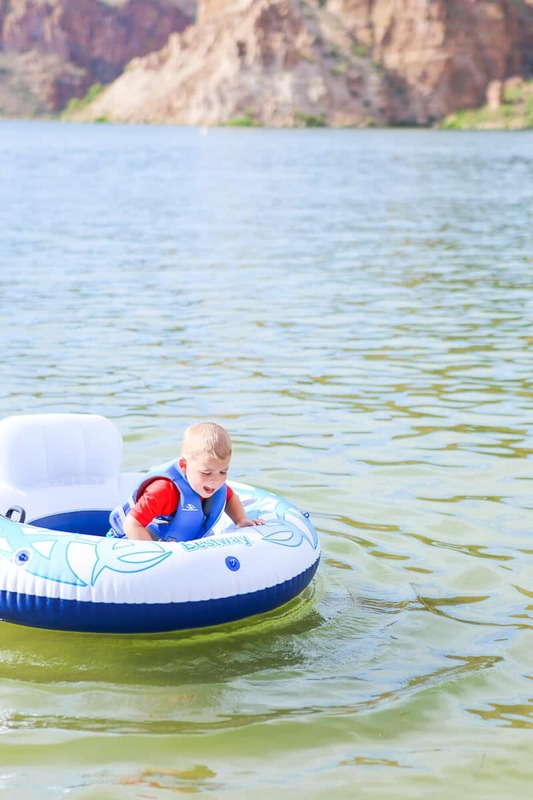 If you’re visiting during the summer or really any of the warmer months like we did for my sister’s bohemian wedding, getting into the water is your best bet for beating the heat. We got a boat with some paddle boards and tubes and spent the day in the water cooling off in one of Phoenix’s many lakes. 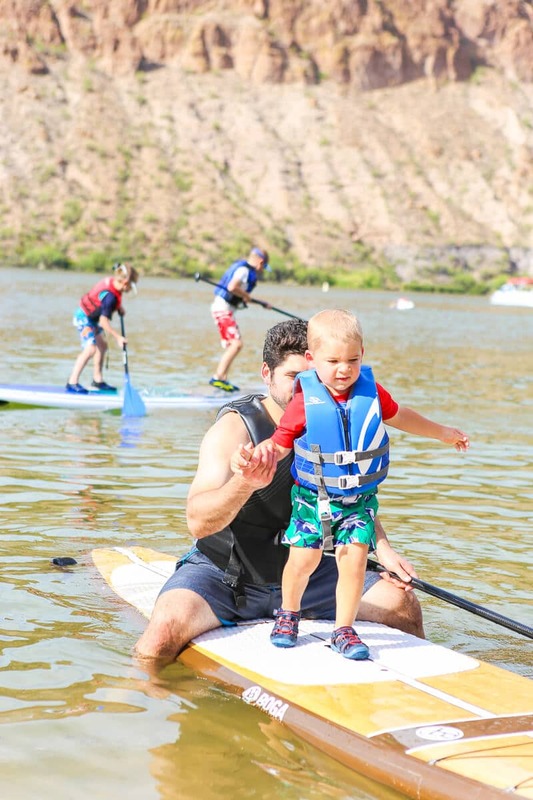 If you don’t have access to a boat or paddle boards like we did, you can rent one here. 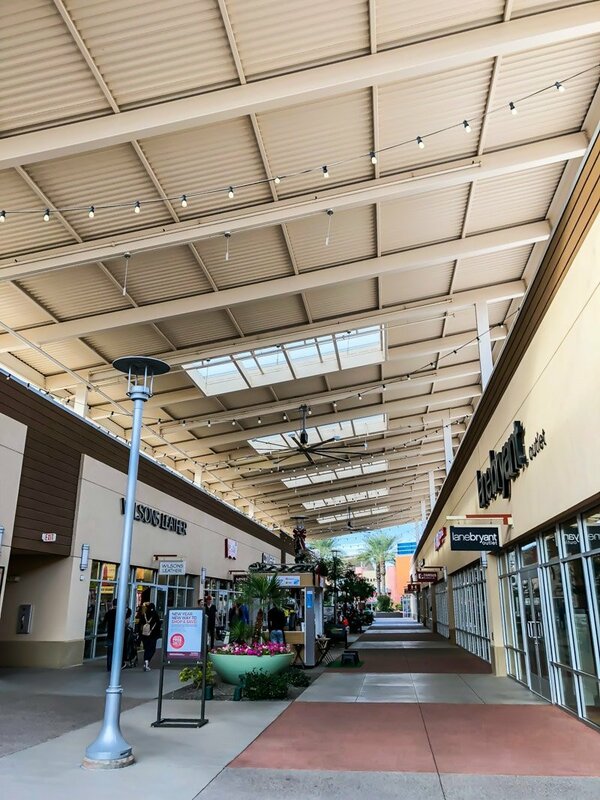 Okay maybe don’t actually shop until you drop but you totally could at the Phoenix Outlet Mall – Tanger Outlets in Glendale. 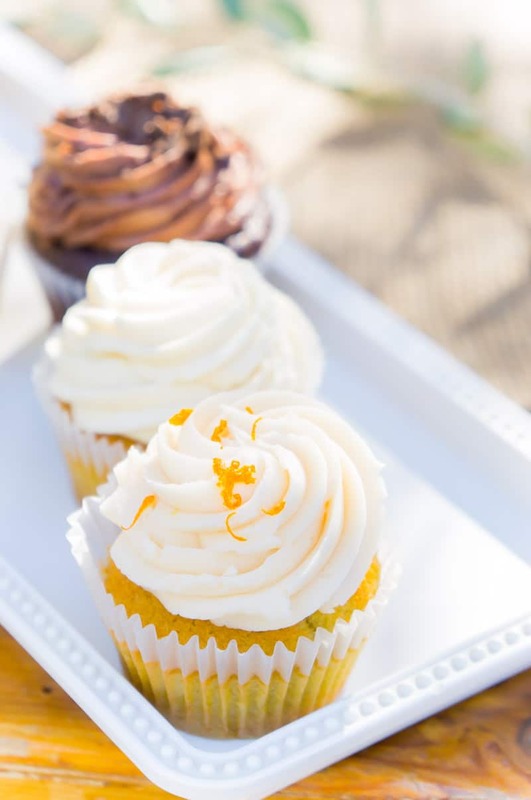 With over 80 different stores, there’s something for every taste and every budget. We had an outlet mall similar to the Tanger Outlets when we lived in VA, and I was there all the time! 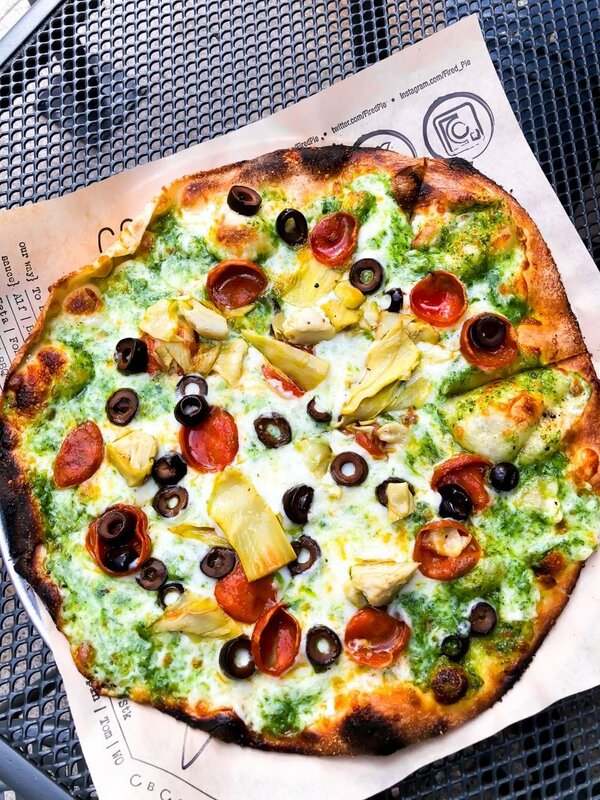 And speaking of taste – don’t miss out on Fired Pie, a restaurant dedicated to making custom pizzas and salads. Both the salads and pizzas were top notch as was the service. I only wish there was a Fired Pie closer to home! No one ever said that you can’t spend an entire day just relaxing at your resort on vacation. 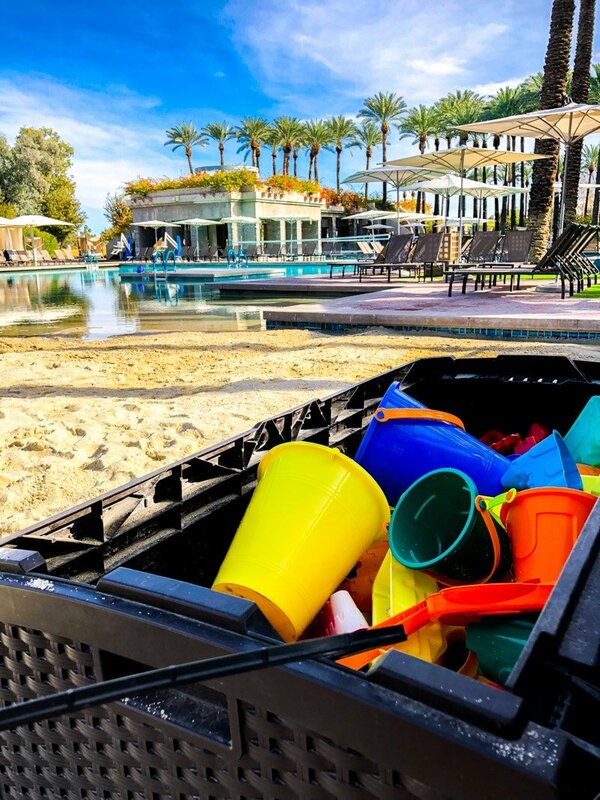 If you’re staying at one of the best family resorts in Phoenix, you’re likely going to want to do just that. 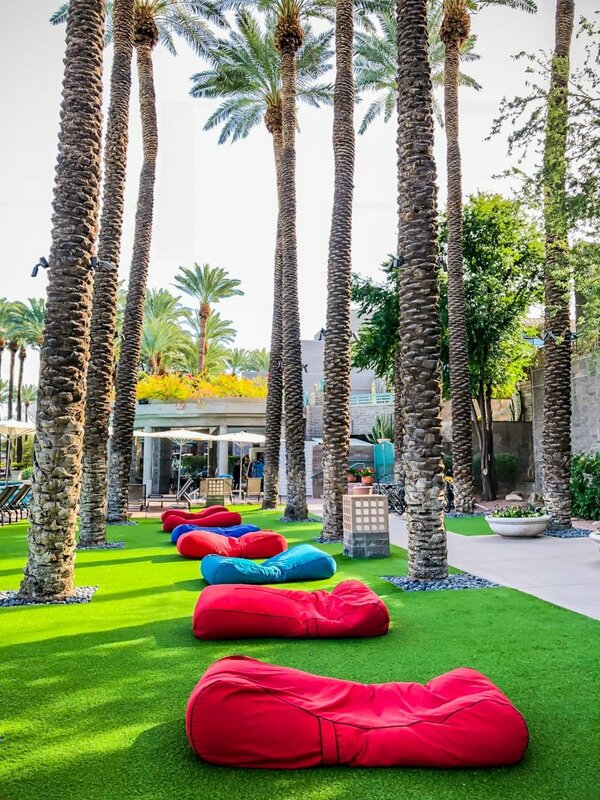 These are two of the most family friendly resorts in Phoenix we’ve found so far with amazing pools, family-friendly rooms, exciting amenities, and plentiful on-site food options! 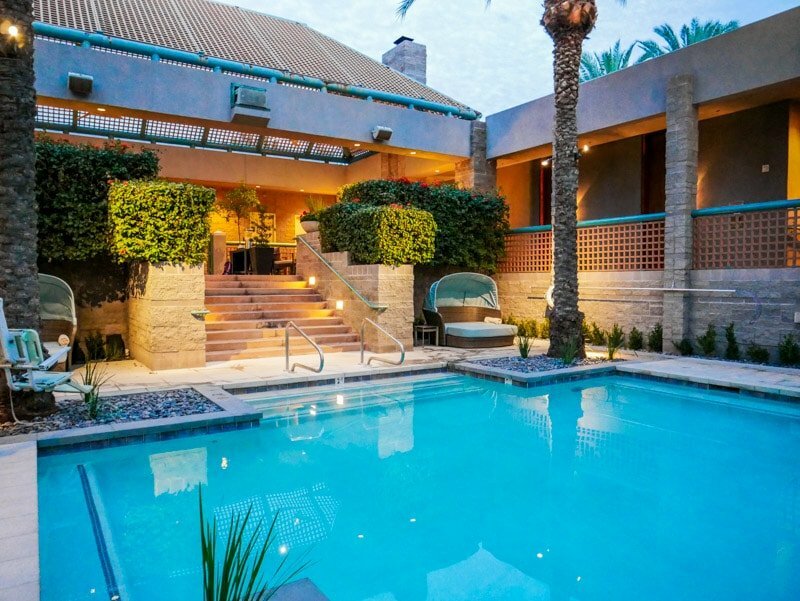 And if you’re traveling sans family, they’re just two awesome resorts in Phoenix period, with or without kids! 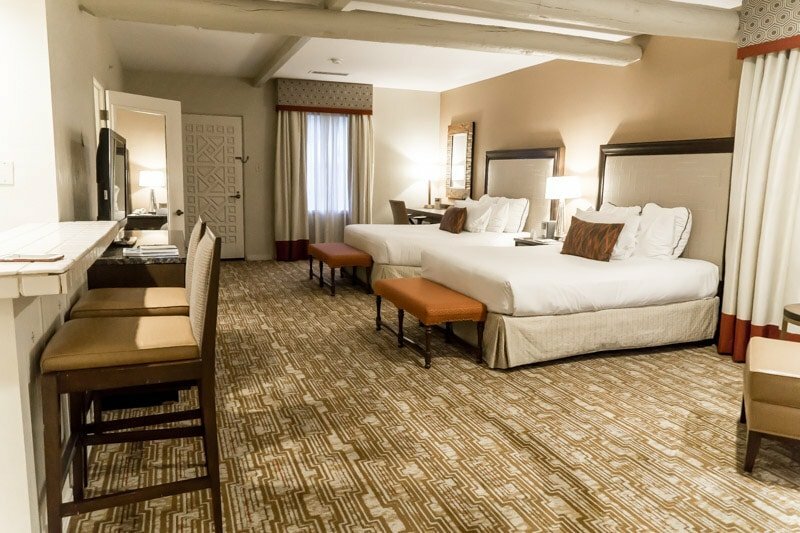 And with The Wigwam on one side of Phoenix and the Hyatt Regency on the other, one of the two should work no matter where you’re spending most of your time! The Hyatt Regency also offers a wine me, dine me culinary option where you can actually sit at the bar while the chef and his team cook a dinner (paired with drinks) specifically for you. It’s fascinating to watch them cook and prepare all of the food right there in front of you so if food is your thing, this could be a great option for adults only. I mentioned at the beginning of this post that I would provide a map of all of my recommendations to make it easier for you to plan your trip. Well here it is! As you can see, things are spread out across the Phoenix area so choose what you want to do and when you want to do it wisely. Or you’ll end up doing what we did – driving back and forth for half of our trip. 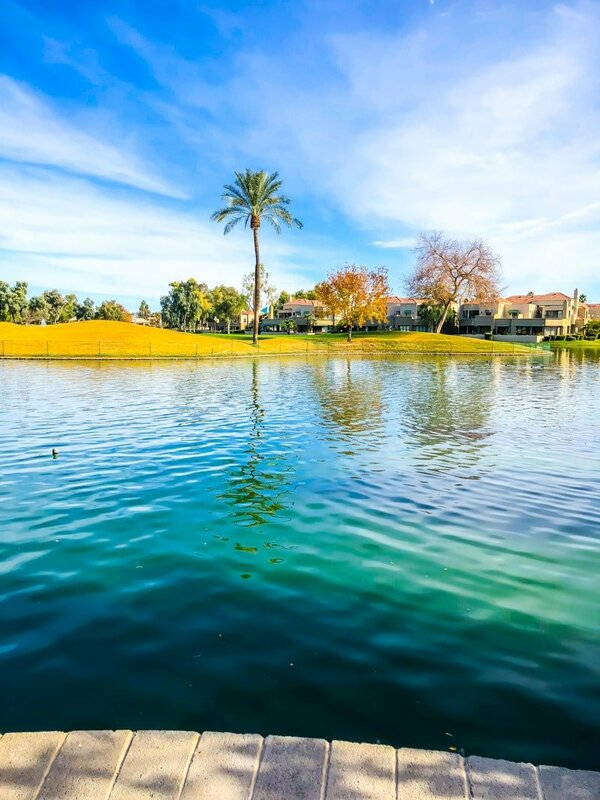 Want More Great Things to Do in Phoenix AZ? I asked some of my favorite travel bloggers (and moms) about their favorite things to do in Phoenix were. 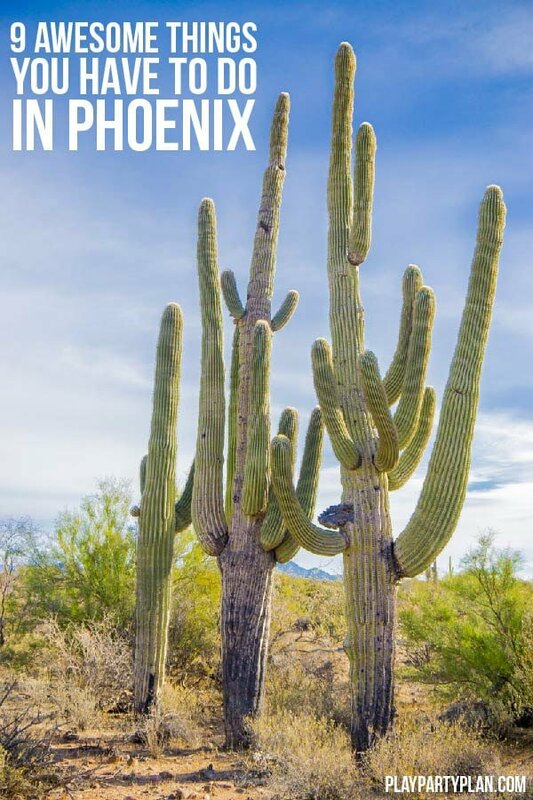 If you need more ideas, here are a couple of additional posts with fantastic things to do in Phoenix! 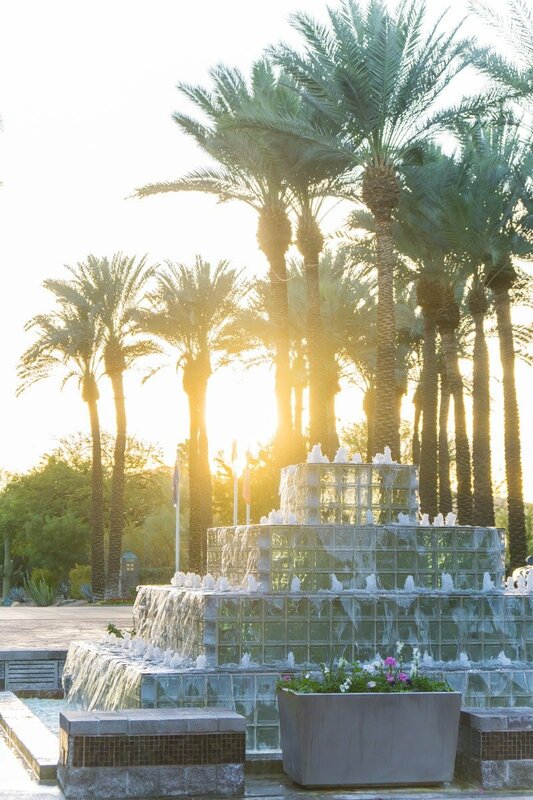 Don’t forget to pin these fun things to do in Phoenix for later! I actually like the beach and ice cream idea. Put that together with a chair to sit on the beach and that sounds like a good weekend.